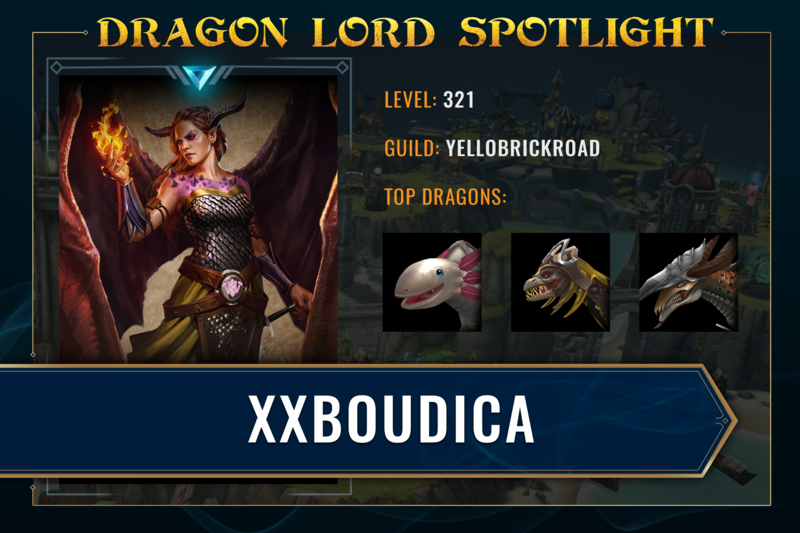 In this edition of Dragon Lord Spotlights, we shine the light on a dedicated member of the Creators Faction and Dean of the War Dragons Academy - xxBoudica! Bou has been a contributing player to the Dragons community for a loooong time, and it’s only right for us to share her tale. Read on to learn more about all the great things Bou provides to the War Dragons community! I started playing War Dragons in February 2017. My current level is 321 (I think) and I have recently joined a team called the YelloBrickRoad (Met FearDiabhl – the good witch or wizard who pointed us this way), and right now we are in Sapphire 2 but seem to bounce between Sapp 1 and 2. I was looking for another avenue to have some fun with my friend (shout-out kamikOZZIE) when the last game we were playing entered a ridiculous level of crazy spending. Outside of the social aspect, my favorite would have to be hatching and leveling a new baby Dragon. I love to see and test what the different spells and combos do. You’re currently the Dean of the War Dragons Academy on WarDragons.info. What initially got you into this role and how did you end up as Dean? It all started with a blog and helping to make tutorial videos for the wardragons.info website. I’d asked Ms. Alleviate’s opinion of an Academy-like Facebook group, but she had a much better idea! She then introduced me to the Learning Management System – Worldclass.io, and after some Beta testing, we were off and running! There was and is nothing else available of its kind. We hear that the Academy is celebrating its 1 Year Anniversary this year! What have been some of the best moments you’ve had running the Academy in this past year? Other than the exciting grand opening, some of the best moments are, honestly, when we receive a survey and the user mentions how much the course they took helped them. I also very much appreciate the surveys that offer constructive criticism on how we can make the course they took better. What kind of Dragons teachings do you share on the Academy? Where can players learn the ropes? There is so much already available in the Academy and much more to come! The goal of the Academy was to help new players avoid some of the costly mistakes so many of us made early on. Plus a few for those brand new to Atlas. To check it out, players only need to log in to www.wardragons.info/academy. Who else is involved in the Academy? How do you all work together to run the site? We have also gotten much help in the Academy Facebook Group from many very knowledgeable players who share their own creative content and advice. Are you looking for any additions to the Academy? How could someone go about applying? We definitely are! We could use some professors who have Atlas knowledge to help us build out that aspect of the course curriculum. Players who are interested can go to www.wardragons.info/academy to apply! You’re also very well-known for your weekly Dragons newsletter which is shared through the Academy and online. What’s your creative process to structuring these newsletters, and how you choose to share updates on the game? The War Dragons Academy Weekly Newsletter is one of my favorite things to put together. To structure them, I like to take the relevant information from the week and combine it in one place for players to review. Things like: game update information, recap of new content, the event for the week (both regular game and Atlas now), as well as shout-outs and the Student of the Week giveaway winner. When exciting things are to be announced, players can find my “Special Editions” (different from the Newsletter) in the Facebook group, on my Twitter Page, in the Academy forum thread under “Guides or Resources,” or in the “Letters from the Dean” blog on the .info website. Let's chat a bit about your in-game experience! 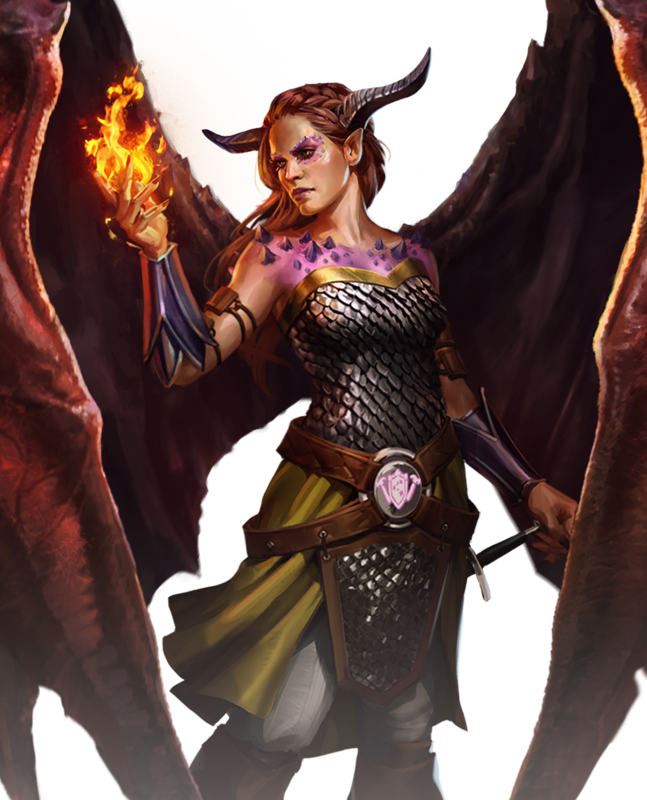 What have been some of your favorite moments in War Dragons so far? I very much enjoy the social aspect of the game. Some of the banter has had me in tears with an aching side. Finding out that I had been accepted into the Creators Faction was definitely a highlight. The hopes was that news of the Academy would spread faster! Personally in game, one of my most favorite moments was actually on a war run. I was supposed to be a decoy run with no hope of winning (base was levels above me). So off we flew, wham 2 defenders, I round the corner to the “kill island” with half a bar of health left, saying out loud “I’m going to die, I’m going to die…” when my little Necryx decides he’s a badass and I’m now yelling to Ozzie who I am on the phone with, “I’m not going to die! !” Soloed! It’s still our cadence when we try to aim higher. As Dean of the War Dragons Academy, the advice I would offer is to check out the courses in the Academy! Start with Breed, Base Building, and XP Runs, then branch out to the Dragon types. As a fellow player, the advice I would give is, ask your questions! The only silly questions are the ones left unasked. Do not overgrow your base (keep it short and tall), your dragons are much more important. What’s it like being a part of the Creators Faction? What’s your favorite part about it? It’s very interesting being a part of the Creators Faction. My favorite part is getting to share new information. I like to break it down and try to present new stuff in the simplest terms. I’m not that great at getting to know the why behind how the game mechanics work but I do love showing others how to make what is available work to the best of their advantage. Wait, people actually get free time??? That’s a real thing? If you could soar through the sky on the back of a single War Dragon which one would it be? I would have to say Rizar. He was far and above my favorite to fly. There are tons of ways to connect with me! Lastly…what’s your favorite Seasonal Divine Dragon? Necryx will hold a special place in my heart but unfortunately I’ve outgrown all his evolve stones so Fohmar has moved in. Fom may have competition though as Axi levels.